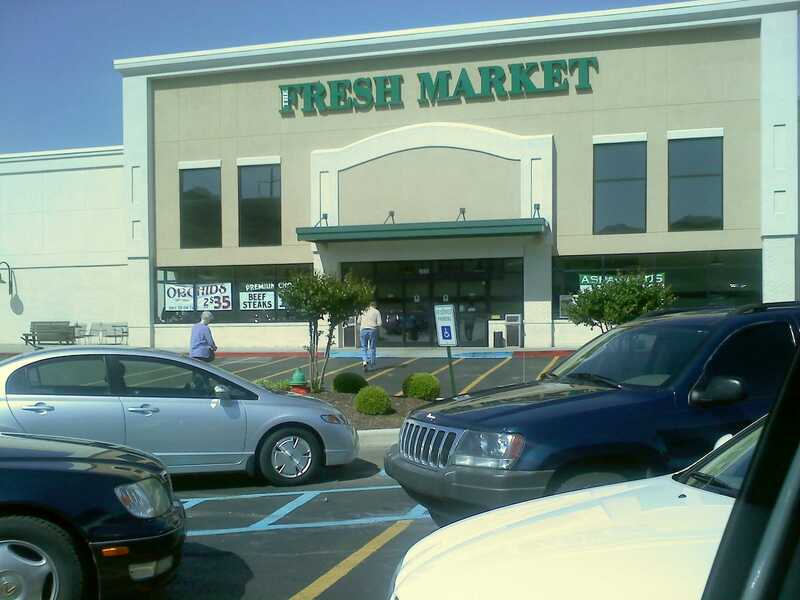 Let’s start out with the fact that I really love shopping at Fresh Market, 4800 Whitesburg Drive South, Huntsville, AL 35802-1699 . It is a foodie’s dream! I could browse there for hours, just checking out all the interesting and exotic food choices. To be honest, I window shop at Fresh Market more than I buy, and I don’t go there very often. At 9 miles from my house, it is too far for me to frequent on a regular basis. Also, their prices are quite high, especially on produce. I usually reserve shopping there for unusual items I might not be able to find anywhere else. Since they do carry many different types of healthy items in bulk, I thought it would be a good place for a blog report. 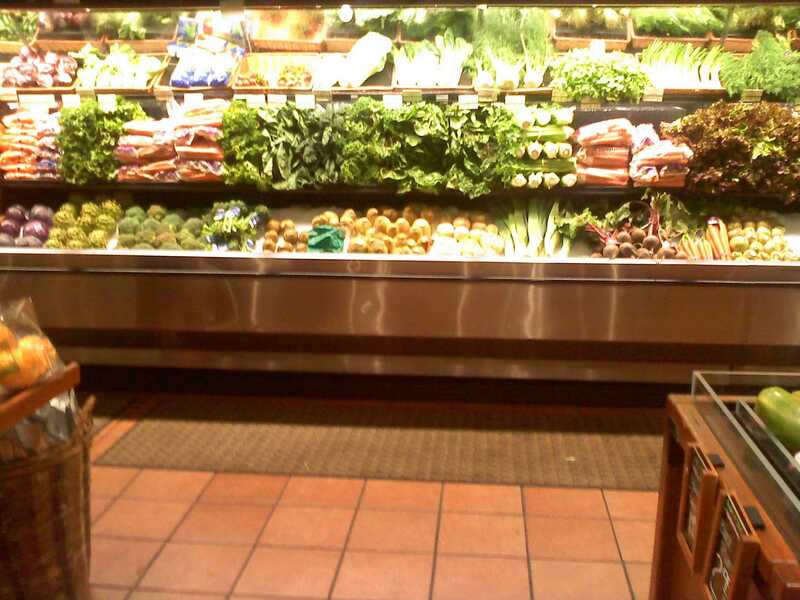 The produce at Fresh Market is absolutely beautiful, and they have a great selection of both organic and conventional. The prices are the highest I’ve seen in town, but they do stock things like heirloom tomatoes, purple sweet potatoes and white asparagus. I lucked out today. 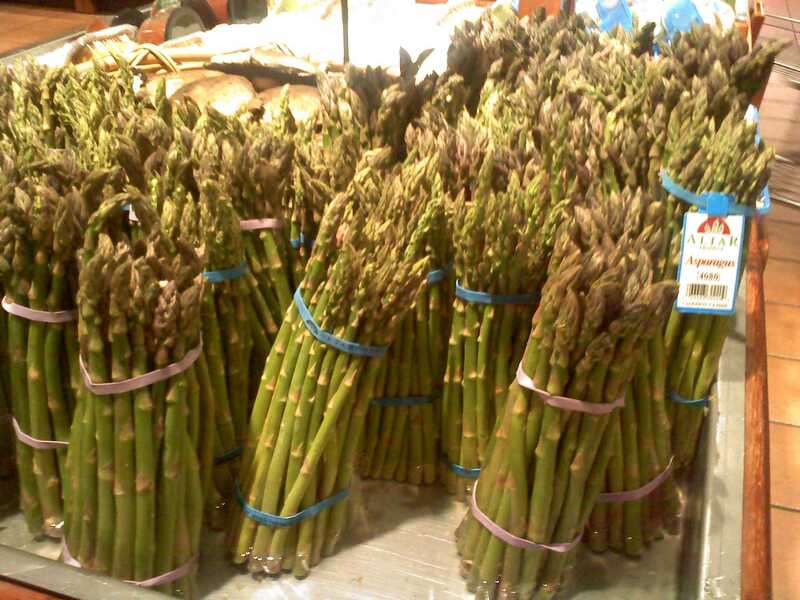 Asparagus was on sale for $1.99/lb! 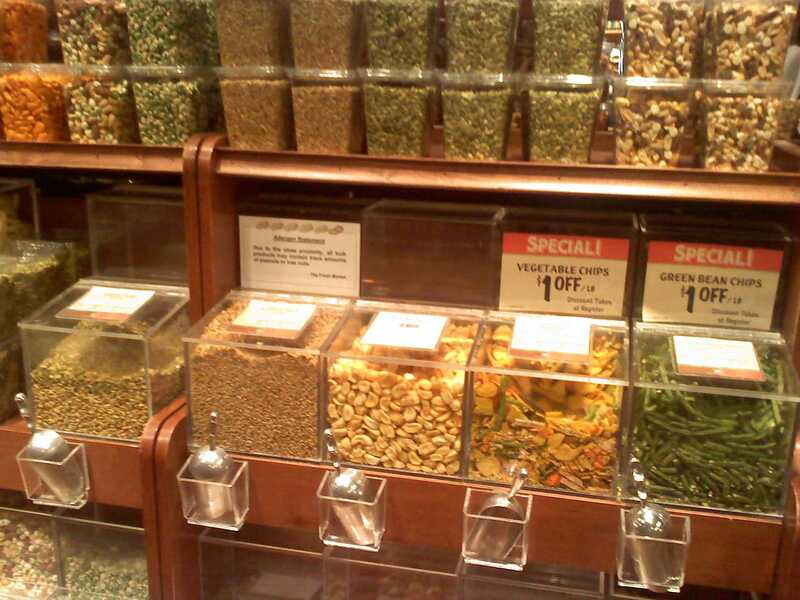 Fresh market carries a number of items in bulk. They have an olive bar, a wide variety of snacks, nuts and nut butters, an extensive deli and a meat department where the meat is laid out like it used to be at a butcher shop (am I dating myself with that one?). I brought my own containers today and asked the deli clerk if I would be able to use them for bulk items. She said that it wouldn’t be a problem for deli items, as it would be easy for her to tare the containers before filling them, but she didn’t know if that would be possible for the dry bulk items. She called the manager, who arrived with a female clerk as back-up. That spooked me a little (see previous blog entry), but both the manager (Mike) and the clerk (Angi) were courteous and helpful. Angi went out of her way to get me a Sharpie to label the weight of my containers and to explain to the cashiers how to subtract the tare weight from the price of my bulk items. They said that it was the first time anyone has brought their own containers, although a lot of people wash out the Fresh Market containers and refill them at the store. Here you can see the filled plastic containers as well as the bulk bins. My husband and I really like the veggie chips. I also bought sliced almonds and freshly ground peanut butter and almond butter. We are stocked up on nuts now because we found a Trader Joe’s when we were in Boston, so we didn’t need much. The deli section includes a wide variety of salads and side dishes, along with a few entrees. This is a good option for a quick but healthy and nutritious meal. I did not need meat today but noticed that they wrapped meat in butcher paper rather than plastic on styrofoam trays. Based on my deli experience I would think that bringing my own container for meat would be no problem. I regret to say that all the bread was in plastic bags. Their bread is very tasty! I bought some of my favorite Fage Greek yogurt, which was on sale. I will have to phase out of that, because it comes in little plastic tubs that I can neither reuse nor recycle. I did see another yogurt I would like to try in the future, but it expired today and I don’t quite love yogurt enough to eat a whole quart in one day! This is a glass bottle. I checked to see if they carried milk in glass bottles but didn’t find any. 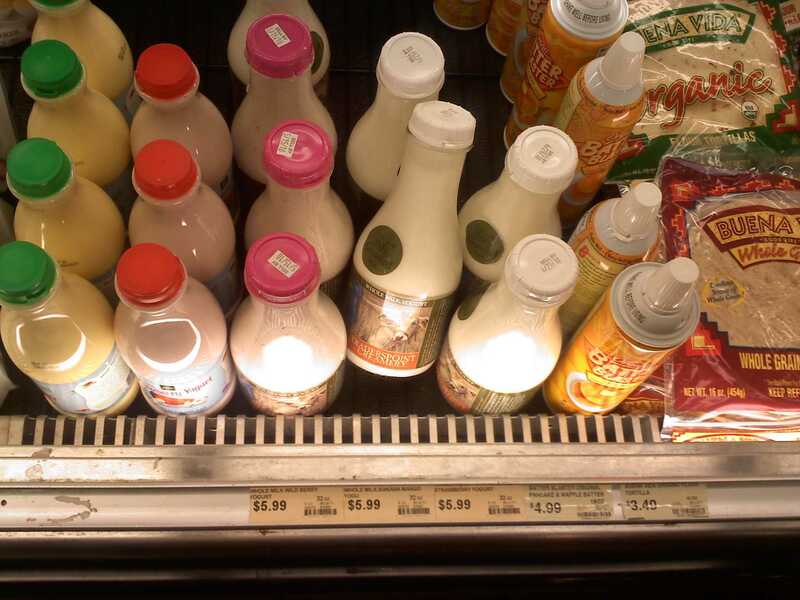 Garden Cove briefly carried milk in returnable glass bottles and I have been looking for that again ever since! If anyone has spotted some in Huntsville please let me know! In summary, Fresh Market is a fun place to shop if you truly love food. The classical music playing overhead is a relaxing touch. Oh, they also have an excellent selection of chocolate! I will update the blog on my next trip and cover some of the departments I didn’t fully investigate today. You may have to check out their wine selection, too. OK, I’ll make sure to include that in my next report!